Billy must complete several mini-quests in order to save the world from destruction, and having lost his survival kit, the Ysygol is only able to supply Billy with rubbish he grabs from the floor in order to complete the mission. It turns out to be the best handful of trash ever. The storyline in this book is incredibly clever. There are some genius touches that mean even the ordinary isn't mundane. You really feel you know the characters and understand their influences and motives. 5 Simple Steps To Saving Planet Earth is beautifully written and has an amazing pace that pulls you in from the very start. The unbelievable seems totally possible. I felt every breath attempted under water and every breeze on Billy's face. There is peril and there is even a death, but they are dealt with incredibly sensitively and it's never too scary. 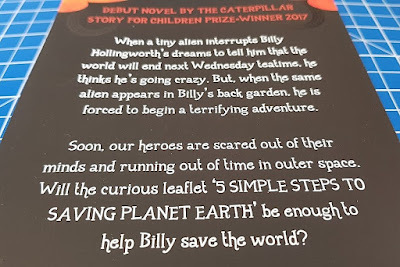 I did have a lump in my throat when Billy is feeling his only option is to give up, but this is a children's book and thankfully I didn't feel a need for a good cry. Ideal for readers 7+ who like adventure and excitement. This is science fiction, but you don't have to like science fiction or understand a single technical term to enjoy it. At only 148 pages it is also a less daunting size of chapter book and an ideal pace for reluctant readers. By page 2 you are already well into the action, no messing. 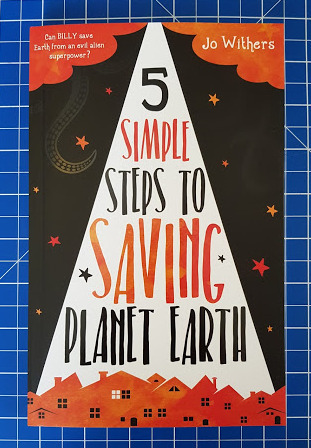 5 Simple Steps To Saving Planet Earth is written by Jo Withers, published by The Book Guild Publishing and available now. Rrp £7.99 from bookshops in-store and online, including direct from The Book Guild Publishing website. When I was little, I won a children's magazine competition. Entrants had to write a joke for the lolly stick for the launch of a new Walls ice lolly called 'Funny Feet'. I came third or something, and won a £5 Walls Ice Cream voucher. This was the olden days and that £5 filled half a trolley with ice lollies and ice cream. Riches beyond any 7 year old's wildest dreams... And I make no apologies for my joke. What do you put at the bottom of a letter to a clown? We were sent our copy of 5 Simple Steps To Saving Planet Earth for review. The joke is honestly hilarious, if you are 10, in the 70's. When people still wrote letters with pens and paper for fun.